PROTECT YOUR BUILDING AND INFRASTRUCTURE FROM LIGHTNING STRIKES. Lightning can strike unexpectedly, causing damage not only to a structure, but also to the systems and people within it. Certain atmospheric conditions can cause a thunderstorm to produce a series of sudden electrical discharges. These discharged currents may cause over-voltages and electromagnetic disturbance which can disturb or damage systems or equipment (including those with electronic components or circuits). Image above shows lightning strikes that hit the UK in 2017. Mid and South Wales are UK hot spots. Designing an effective lightning protection system is a complex process, as the requirements vary for every building. 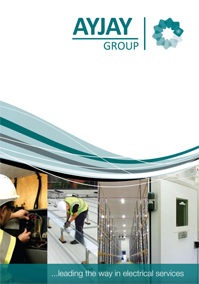 Every installation must be a total solution that encompasses both structural and infrastructure to protect all aspects. 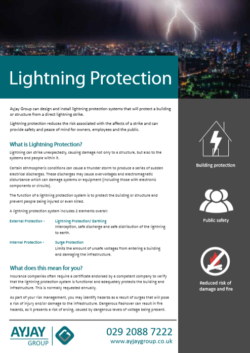 Ayjay Group will help your business design and install the latest British standard (BS EN 62305) lightning protection system, that will reduce the risk of damage. Lightning Protection Design, including recommendations for surge protection. If this is something you would like to discuss, contact our team on 02920 887222.